Inland Empire Renewable Energy Regional Center LLC. Executive Vice President-SolarMax Technology Inc. & Inland Empire Renewable Energy Regional Center LLC. 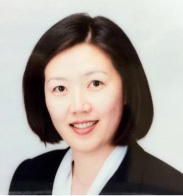 Ms. Ching Liu has over 20 years of experience in global private equity investments. She is an expert in asset-based financing and asset management for both private investors and institutions. Prior to founding Solarmax Technology Inc. (“SolarMax”), she served as the Vice-President of Wealth Management at Merrill Lynch, Pierce Fenner & Smith. SolarMax is a full-service photovoltaic solar energy systems integrator that designs, sells, leases, installs and finances solar energy systems for commercial and residential customers nationwide. Ms. Liu presently serves as Executive Vice President of SolarMax. 2008 – Current: Executive Vice President at SolarMax Tech, Inc and Inland Empire Renewable Energy Regional Center. 2000 – 2008: Vice President of Wealth Management at Merrill Lynch. 1994 – 2000: Vice President of Premier Banking at Wells Fargo. 1987 – 1997: Bank of America, Retail Branch Manager.